Severe weather, tornado, storm chasing pictures and online information source. 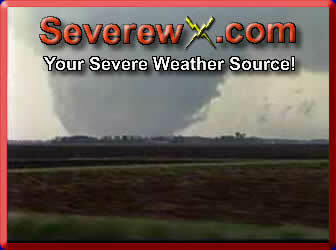 Severewx.com Team Catches Glenville, MN Mayday Twister. See Our Chase Report Here! Sign up for our E-mail update list to keep you informed of major changes on this site's severe weather content. Severewx.com is a site being built by meteorologists and storm chasers so the information contained on this page can be of the highest quality. The intent of this page is to educate the public on tornadoes, severe thunderstorms, storm chasing, and other topics related to the weather. While we continue to put on the site what we think will be of most interest to the general public, only YOU can tell us what you want to see. Please give us your feedback through our "Contact Us" page so we can build this site to better to meet your expectations. Tell us what you like or don't like about our web site to help us reach our goal of becoming one of the best weather pages on the Internet. July winner and July-September Quarterly winner of the AIT most innovative website award! Visit our awards gallery to view this award!